Although realistic soil and rock foundations reveal noticeable deviations in their properties from homogeneity and isotropy, the model of the homogeneous isotropie elastic half-space is widely used when studying static and dynamie interactions between a defonnable foundation and structures. This is explained by significant mathematieal difficulties inherent in problems conceming mechanies of anisotropie and heterogeneous elastic bodies. Solving the basic static and dynamie problems for heterogeneous and anisotropic half-spaces, such as different contact problems and problems of constructing Green's functions, has become possible in the last few decades due to the development of computer engineering techniques and numerical methods. 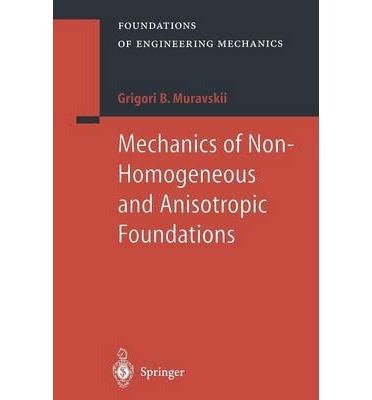 This book contains the results of investigations in the area of statics and dynamies of heterogeneous and anisotropic foundations, carried out by the author in the last five years while working in the Faculty of Civil Engineering at Technion - Israel Institute of Technology. The book is directed at engineers and scientists in the areas of soil mechanics, soil-structures interaction, seismology and geophysics. Some characteristic features of the book are: i) Constructing (Chap.l) solutions in a general fonn for the heterogeneous (in the depth direction) transversely isotropic elastic half-space subjected to different loadings, hannonic in time. Characteristics of the given half-space have an influence on functions (of depth z and parameter k of Hankel's transfonns), which are detennined from a system of ordinary differential equations.